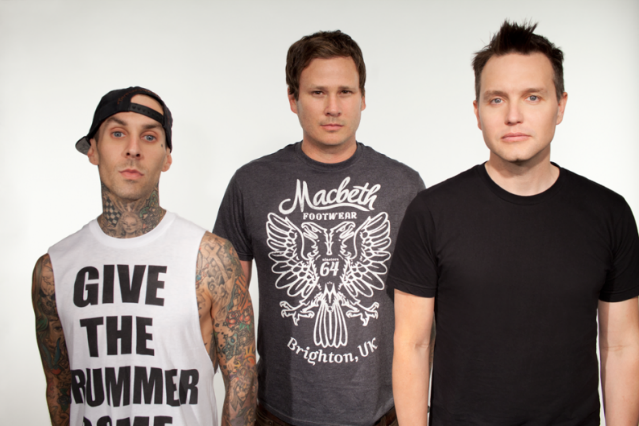 As if to remind fans that rock stars are people too, Blink-182 have announced their withdrawal from the Bamboozle in New Jersey next weekend as well as their next six anniversary tour dates for the rest of May due to the medical ailment that most commonly crops up on sitcoms: Drummer Travis Barker has to get an emergency tonsillectomy. Things just keep getting more and more annoying for this dude, don’t they? At any rate, at least he’s not alone in the battle against throat issues. In a not exactly apples-to-apples response, the fest has asked Jersey homeboys and recent Blink tourmates My Chemical Romance to step in for the trio. Fans shouldn’t be too disappointed; after all, it’s not as if the lineup, which still includes Foo Fighters, Incubus, Skrillex, Bon Jovi, and (somehow) Kreayshawn, was that predictable to begin with.